After choosing your vehicle, click the “Buy now” button. You’ll be able to select which upgrades fit you and your new car best. Add-ons such as Extended Service Contract, GAP Coverage, Prepaid Maintenance, Driver’s Armour, and other options are all available to help protect your investment. Once you select your upgrades, press “Continue”. Next, you can choose if you want FREE delivery* to your home or work. In with the new and out with the old? No problem! 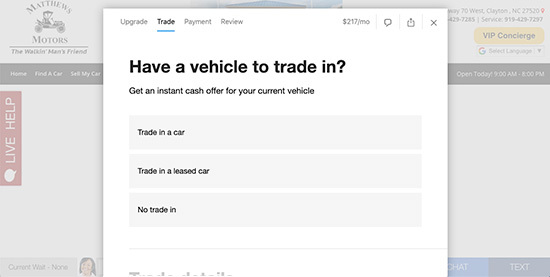 If you have a vehicle to trade, you can select “Trade in a car”. Fill out the details about your car and hit “Continue”. Your trade-in will be evaluated through data provided by Kelley Blue Book for an instant quote which can be applied to your purchase immediately. Or you can select “No trade in” to move forward. 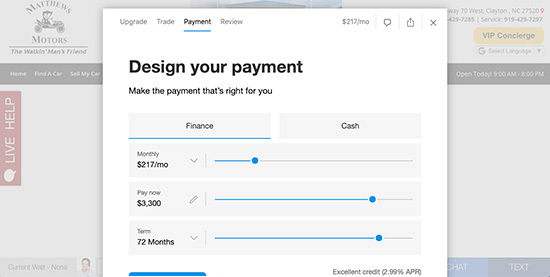 This easy calculation tool will let you design your payment. Start with the payment type by choosing “Financing” or “Pay Full”. After choosing an option, you will be able to scale your Monthly payments, Down payment, Term, and Credit score to an ideal, manageable plan built for you. After you hit “Continue”, fill out your personal information including Billing info, Income info, and Credit info. After your details are filled out, you can review your final cart. For your final step, double-check that your order is 100% correct in regards to your upgrades, total amount financed, and payment plan. Then, sign with your full name and click “Place order”! 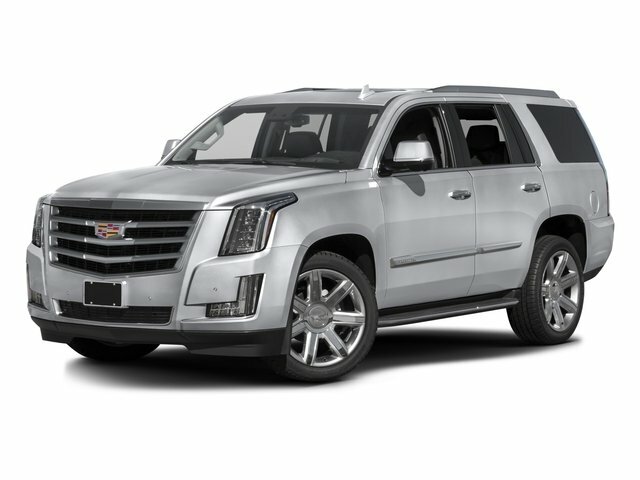 Your order will be sent to the dealership so we can complete your transaction upon approval! Shortly after, you’ll receive a confirmation email with your purchase details. *Free delivery included within a 50 mile radius. Ask for details about delivery outside of 50 miles. If you have a question that is not answered here, please contact us and we'll get you an answer promptly. When can I test drive the vehicle? You can choose to have the test drive be the first step in your delivery process - or you can have your vehicle brought to you for a test drive in advance. Your purchase is always subject to your approval of both the vehicle and the transaction details. Pick out the car you want and use the Buy Online shopping cart to make sure it fits your budget. 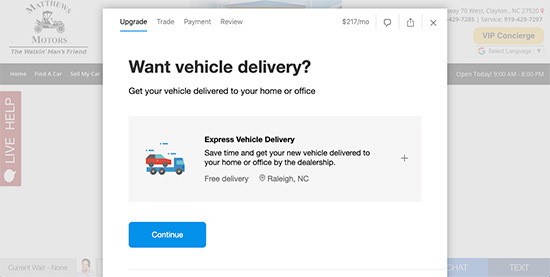 Your completion step will include the option to pick up the vehicle at the dealership or have it delivered to your home or office. Whether you complete your test drive in advance or do it as a final step, you'll always drive the vehicle prior to finishing the delivery process. No matter the sequence - If for any reason the vehicle doesn't meet your expectations, our exclusive 4 Day Love-It-Or-Leave-It Return Policy will ensure you won’t make a mistake. Is delivery available if I live or work far away? Yes - We offer delivery anywhere! Within a 50 mile radius, delivery is FREE. If you live or work outside of our free delivery radius, check with one of our Vehicle Specialists to get a delivery cost. We'll do our very best to accommodate your needs and make sure we meet your expectations. Am I required to give a deposit or make a down payment to complete my purchase arrangement online? No. You can complete a purchase arrangement online without money down. Many of our customers choose to do financing or leasing with no money at all. In the event you decide to use a down payment, you can do that at delivery and our staff will guide you through payment options. 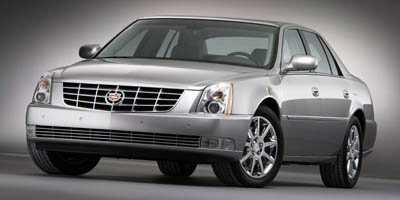 How does the trade-in of my old car work? We use the third-party independent valuation calculator provided by Kelley Blue Book. You'll enter your vehicle info and select "Very Good", "Good" or "Fair" based on the description of each condition. You'll immediately be presented with the actual cash value of your trade-in that you can apply to your vehicle purchase. 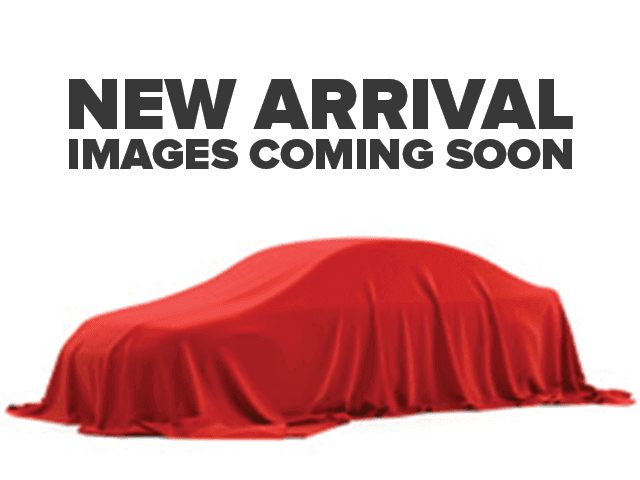 Prior to delivery - our Vehicle Specialist will confirm your trade-in details. We'll verify the amount owed (if applicable). Our experience has been that our customer's trade descriptions and the calculated values are quite accurate. We'll inspect your vehicle either prior to or at delivery. Our customers are generally good about letting us know of any concerns so that we can make sure the transaction meets expectations. 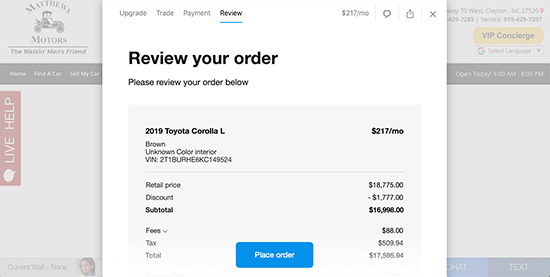 If for any reason the Actual Cash Value offered for your trade-in appears inaccurate or if you have any questions, please let us know and we'll review the details for you. A final trade in value must always include a vehicle inspection by one of our trained professionals before a final cash value can be reached. What about financing, rates and terms? When you select a credit-score range, you immediately see your payment, rate and term. We have dozens of lenders and programs that compete for your business. Once submitted, we find an approval that works for you. Buying online doesn’t always ensure your automatically approved however. Approval is validated by the banks after the specific information you provided is submitted. How does home or Work Delivery work? We'll review all the transactions details with you in advance. You'll know the exact price and terms. Your vehicle, registration, title and related information will be verified accurate to make sure we get things done right. If there is anything to be resolved prior to delivery, your Vehicle Specialist will follow up and make sure it happens as you expect. You select a date, time and location. Your Vehicle Specialist will inspect your vehicle at the dealership to make sure it's 100% ready for delivery to you. At your home or office, you'll test drive your vehicle. Your Specialist will go over the vehicle and make sure you are comfortable with its features. When satisfied, you and your Specialist will go through the paperwork together with each document explained. Your Specialist will provide a virtual tour / introduction to our service department and we'll book your first service. We understand that spending hours at a dealership can zap all the fun out of car buying. That’s why at Matthews Motors of Clayton, you can purchase your next vehicle from the comfort of your own home. When you choose us, going through the entire process — from start to finish — is as simple as pointing, clicking, and buying. The Matthews Motors of Clayton team will be with you all the way. Don’t hesitate to contact us today with any questions you might have.